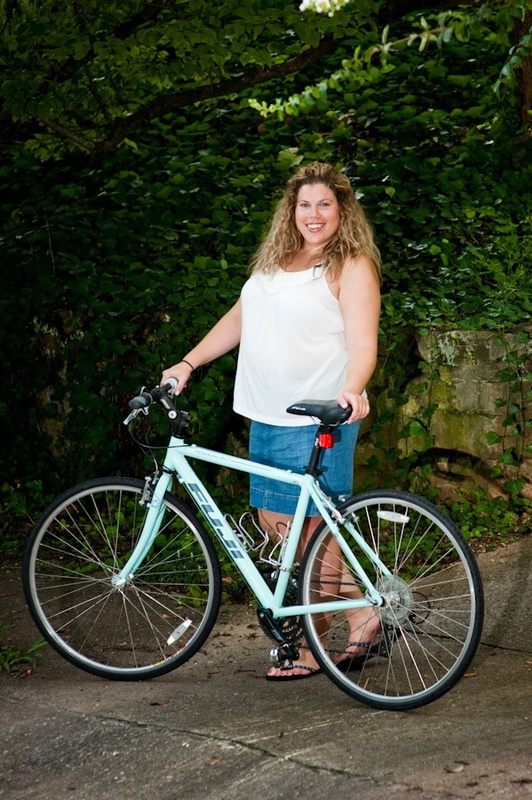 This is the first in a series of profiles of Birmingham Cyclists of all shapes, sizes and riding habits. I want to highlight and celebrate those of us who brave it all and ride in Birmingham. I have quite a few people who have agreed to be part of this, so I hope you will enjoy it. Each week will be a new rider in a variety of profile formats, from stories to Q&A, etc. World-meet Birmingham! 1. What kind of bike do you ride? Is there a story behind that? I ride a Fuji Absolute 3.0. Her name is Gabriella, I named her after an Avett Brothers song, and she’s a road/path hybrid. I had been looking on Craigslist for a gently used bike, but couldn’t find exactly what I was looking for. A friend that I was visiting in Oxford, MS took me to the local bike shop, Active Oxford. When we pulled up, Gabby was sitting in the window and I fell in love. She was exactly what I had been looking for. I instantly loved her color. I took her for a spin in the parking lot and was sold. 2. When did you start riding? I loved to ride bikes when I was growing up, but just in the past year I reconnected with a friend that lives in Oxford, MS. Oxford is a such a bike friendly town that I always felt left out when I would visit. Everyone would ride bikes instead of driving, talk about bikes, build new bikes, etc. One weekend we went on a ride and I had forgotten how much I loved it. 3. What is your favorite aspect of riding in Birmingham? My favorite aspect of riding in Birmingham would have to be the varied terrain. Where ever I may ride, there are always several climbs involved. I used to dread it and there are still plenty of hills that intimidate me, but it’s made me a much stronger rider. 4. What are the things you would like to change about riding in Bham? I would love if Birmingham had extensive bike lanes throughout the city and into the suburbs. Riding in traffic still stresses me out. It’s amazing how much more relaxed I am if I ride in a city that has bike lanes. Earlier this summer I drove through Albuquerque, New Mexico. After stopping in a local bike shop, I found out that Albuquerque had an extensive bike path/lane system throughout the city. I was able to go for a ride and after my ride, I had a new appreciation for bike lanes. Its amazing the peace that 3-5 extra feet of asphalt will give you. 5. Why do you ride? I ride because it takes me to another place. I feel organic and self sufficient when I ride. I don’t have to pay for gas or insurance, I honestly earn every mile I pedal and find such freedom in that. I know that I’m doing a good thing for the environment and for myself. Thanks for playing Stacey! A girl who names her bike after a song? That I can behind. Oh, and check out the cute skirt! Stay tuned for another profile next week. Live in Birmingham? Let us profile you. Send an email to elisa@bikeskirt.com. we are all heros right? Right on Stacey and kudos Elisa! What up Stacey, great to see you on one of my favorite blogs! Amen on bike lanes — we just moved to carrboro, nc and they’re everywhere an encouragement to ditch the four tires for a skinnier two! Hope you’re well (and say hey to Stephen for me)! Great call on the personal interviews – how awesome! awww stephen i didn’t even know you read our little blog! and yay stacy! bike friends! Okay, so this blog gets better every time I visit. This is a great idea and I agree that Oxford, MS is a great little bike town. If you want your very own bike portrait come to pepper place market (Birmingham) this Saturday mroning and drop by the Almalatina.org photobooth I’ll be running from 9 to 11. I’ll try and make you look as good as Stacy. Plus you can crank your own smoothie over at the Bici Coop bike blender. your bike has a good color and I agree that Oxford, MS is a great little bike town.